During the 1913 Lockout in Dublin, tens of thousands of workers became involved in the most severe industrial dispute the country has ever seen. A new book of essays, edited by Franics Devine, shows how the dispute led to riots, bankruptcy and death. The Dublin Lockout was a major industrial dispute that raged between 300 employers and approximately 20.000 workers in the capital between August 1913 and 18 January 1914, provoked by demands for better labour conditions. The most severe industrial dispute in Irish history, the action was ultimately unsuccessful in achieving pay and conditions that were substantially better for workers – however, it succeeded in bringing employers to their knees and marked a watershed moment in Irish labour culture by firmly asserting worker solidarity. younger newspaper vendors joined the strike in 1913, which is not surprising, because Desmond Greaves has shown that Larkin had unionised some of the vendors two years earlier. Newsvendors appeared to be spilt on the issue of striking and in an interview in one of his newspapers, William Martin Murphy said that his newsboys had been attacked several times since the strike begun. The Weekly Irish Timer reported that Christopher Crosbie (aged 18) and four boys, one being Patrick Cleary (aged 13) had assaulted Evening Herald newsboy, Matthew Mahon. Mahon had been told by his attackers to put his papers down or they would keep beating him. This was not an isolated incident, on 6 September, James Quinn who was described as a ‘little boy’, was confronted at Nelson’s Pillar but managed to escape from his attackers. The Lockout caused widespread distress as labourers everywhere began to get locked out of work. Though not all workers were locked out or striking, their work environment would have been heavily affected. In one case, Mary Murphy, a factory worker, aged 14, was charged with attacking another girl from her factory, Messrs. W. & R. Jacob’s, as she went into work. Trying to continue working amidst the Lockout was made harder by the continuous update to their ‘scabs’ list, published in The Irish Worker. The scab list was a list of people still working for companies that had locked out employees. The 27 October issue gives an example of this, as the papers mention both companies and people who were ‘scabs’, giving full addresses for most. It is surprising with lists such as this that more beatings were not reported in the newspapers, like for instance, that of James Reilly, who was harassed at his home by locked-out workers of the same company for which he worked. Working during this chaotic period was not the only way of getting hurt; the infamous large-scale riots had thousands of casualties and a number of deaths. On 2 September, The Freeman’s Journal reported that 400 people had been injured over two days of rioting in the city, these riots also led to the loss of two lives, James Nolan and James Byrne. Large numbers of people were arrested during the following days, and by 3 September several minors were facing charges for throwing missiles at police. James Doyle was arrested on Winetavern Street and had his head bandaged when he was arrested. James Brady was also in the same state when he was arrested on Mary Street for the same crime. This was the first of many riots that took place throughout this period until December. Dublin Castle’s intelligence report gave an account of rioting in Finglas on 16 September, in which Patrick Daly was shot in the back by a police constable. Patrick Daly, who was 17 years old, was described as a quiet boy and employed in the local village. He recovered from his wound, as the bullet had hit his shoulder. By 23 September the state of the city had become very dangerous for civilians and police and the commissioner of the police reported that he did not have enough uniformed police to perform all the necessary duties. Strangely, the intelligence report does not record if he received extra men to help with the situation, as he already had use of military stations in Dublin. The Dublin Scout Association, also known as the Baden Powell scouts, asked its members to stop wearing uniforms in the city until further notice, and this can be assumed to be for the boy scouts’ safety. A martyr and victim of the violence during this period was Alice Brady. Brady was 16 years old; a member of the Irish Women Workers’ Union (IWWU) who was shot in the hand during a minor riot in Great Brunswick Street. She died a month later from tetanus. The riot had been caused when a group of women screamed at coal workers, who apparently broke the strike; one worker panicked and set off his revolver. In the court case it was argued that the man, Patrick Traynor, did not mean to shoot at anyone and did not aim at Brady. Alice Brady’s funeral took place in January 1914 and was used for propaganda. The Freeman’s Journal noted that the procession was large, with 500 IWWU in attendance along with several other bodies represented. James Larkin, James Connolly, Delia Larkin and Countess Markievicz walked behind the parents in the procession, with graveside orations given by both Larkin and Connolly. Larkin said that their sister had been sacrificed at the altar of sweating misery and degradation; with her great strength of character she would have been a great woman. When giving sympathies to the parents, he also gave his sympathies to the IWWU on their loss. He finished by saying that they would leave her graveside more determined than ever to have an Ireland free from slavery thraldom, while James Connolly stated that her death was on every ‘scab’ and employer of a ‘scab’. A Capital in Conflict: Dublin City and the 1913 Lockout is edited by Francis Devine and published by Four Courts Press. The book’s official launch, by the Lord Mayor, will take place on Saturday 13 April 2013. 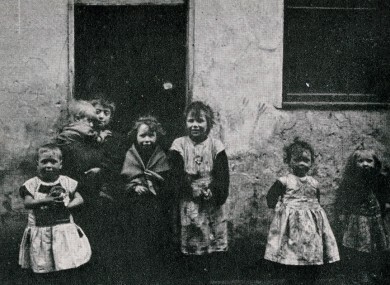 Email “Extract: The strikers and scabs of the Dublin 1913 Lockout (photos)”. Feedback on “Extract: The strikers and scabs of the Dublin 1913 Lockout (photos)”.